Ögedei Khan, Ögedei; also Ogotai or Oktay (c. 1186 – 1241), was the third son of Genghis Khan and second Great Khan of the Mongol Empire by succeeding his father. He continued the expansion of the empire that his father had begun, and was the Great Khan when the Mongol Empire reached its furthest extent west during the invasion of Europe. Like all of Genghis' primary sons, he participated extensively in conquests in Western China and Central Asia. As the Mongols arrived on the edge of the European space, then entered that area, Europeans—or at least those who stood in their immediate path—saw the Mongols as a new threat. Yet their arrival from the East also served to remind Europeans that a world existed beyond their horizons. Ögedei established political stability throughout Asia. Under his rule, too, the Silk Road was re-established, which opened up trade and commerce between East and West. Marco Polo would soon travel along this route, followed by others. Often absorbing local customs wherever they settled, the Mongols under Ögedei and his successors also helped to build bridges between some of the world's cultures. Ögedei was the third son of Genghis Khan, and was considered to be his father's favorite son, ever since his childhood. As an adult Ögedei was known for his ability to sway doubters in any debate in which he was involved, simply by the force of his personality. He was a physically big, jovial, and very charismatic man, who seemed mostly to be interested in enjoying good times. He was intelligent and steady in character. His charisma was partially credited for his success in keeping the Mongol Empire on the path that his father had set. Ögedei was also known to be a humble man, who knew his human limitations, did not believe himself to be a genius, and was willing to listen and use the great generals that his father left him, as well as those he himself found to be most capable. Like all Mongols at his time, he was raised and educated as a warrior from childhood, and as the son of Genghis Khan, he was a part of his father's plan to establish a world empire. His military experience was notable for his willingness to listen to his generals, and adapt to the circumstances. He was an extremely pragmatic person, much like his father, and looked at the end, rather than the means. His steadiness of character and dependability were the traits that his father most valued, and that gained him the role of successor to his father, despite his two older brothers. Coronation of Ogodei in 1229. Rashid al-Din, early 14th century. He was elected supreme khan in 1229, at the kurultai (meeting) held after Genghis' death, although this was never really in doubt as it was Genghis' clear wish that he be succeeded by Ögedei. His charisma is partially credited for his success in keeping the Empire on his father's path. Thanks mostly to the organization left behind by Genghis Khan, and the personal charisma of Ögedei, the affairs of the Mongol Empire remained for the most part stable during his reign. Ögedei was an extremely pragmatic man, and knew his limitations. He had no delusions that he was his father's equal as a military commander or organizer, and used the abilities of those he found most capable. In 1235, he finished Karakorum, the capital of Mongol Empire. During his reign, the Mongols completed the destruction of the Jurchen Jin empire (in 1234), coming into contact and conflict with the Southern Song. In 1235, under the khan's direct generalship, the Mongols began a war of conquest that would not end for forty-five years, and would result in the complete annexation of all of China. Mongol armies vassalized Korea, established permanent control of Persia proper (commanded by Chormagan) and, most notably, expanded westward under the command of Batu Khan to subdue the Russian steppe. Their western conquests included almost all of Russia (save Novgorod, which became a vassal), Hungary, and Poland. Ögedei's sons Kadan and Güyük Khan attacked Poland and Transylvania, respectively. Ögedei Khan had granted permission to invade the remainder of Europe, all the way to the "Great Sea," the Atlantic Ocean, and only his death prevented the possible invasions of Austria, Germany, Italy, France, and Spain, and the remaining small European principalities. Indeed, Mongol forces were moving on Vienna, launching a fierce winter campaign against Austria and Germany in the first wave into Western Europe, when Ögedei died. Some historians believe only his death prevented the complete conquest of Europe. The Mongol expansion throughout the Asian continent under the leadership of Ögedei helped bring political stability and re-establish the Silk Road, the primary trading route between East and West. Ögedei's death in 1241 brought the Mongol invasion of Europe to a premature end. The commanders heard the news as they were advancing on Vienna, and withdrew for the Ikh kurultai in Mongolia, never again to return so far west. His son Güyük Khan eventually succeeded him after the five-year regency of his widow Töregene Khatun. But Batu Khan, Khan of the Kipchak Khanate in Russia, never accepted Guyuk, who died on the way to confront him. It was not until 1255, well into the reign of Mongke Khan, that Batu felt secure enough to again prepare to invade Europe. Fortunately for the Europeans, he died before his plans could be implemented. His son intended to carry them out, but he also died, and in 1258, Batu's brother Berke, ascended to the Kipchak Khanate. A Muslim, he was more interested in stopping his cousin Hulagu from doing any more damage to the Holy Land than invading Europe. Historians mark the decline of the united Mongol Empire from Ogedei's death, though Mongke's ascension halted the interfamilial fighting for a time. 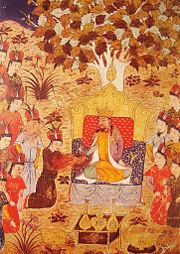 At the death of Mongke, Mongke's youngest brother Arik Boke was declared the Great Khan. Then there was four-year long civil war between Arik Böke and Kublai Khan, who was also Mongke's brother. Eventually, Kublai Khan won. 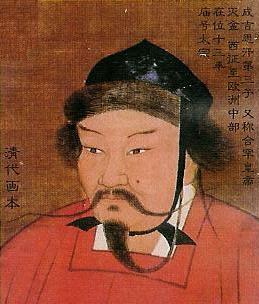 Kaidu, a descendant of Ogedei, refused to recognize Kublai Khan as the Great Khan. This started many battles between Kaidu and Kublai Khan. After Kaidu's son, Ogedei's line basically finished in the struggle for power. The unity of the Mongols ended because of the power struggle among the various Mongol princes. Kublai Khan's descendants were recognized as the Great Khan only in Mongolia and China and the surrounding areas. Ögedei Khan helped to consolidate the Mongol Empire, which did much to link communities and peoples that previously had little or no contact. This period has been described as the Pax Mongolia. In particular, he opened up communication between East and West. On the one hand, Europeans saw the Mongols as a threat, although Europeans in the West appear to have been content to let the Hungarians and others in Eastern Europe serve as a buffer-zone, containing the threat to the East. On the other hand, the Mongols' arrival on the borders of the European space from the East reminded Europeans that a world existed beyond their horizons. The political stability that Ögedei established throughout Asia re-established the Silk Road, the primary trading route between East and West. Before long, Marco Polo was traveling this route, followed by others. The Mongols absorbed local customs wherever they settled, and so helped to build bridges between some of the world's cultures. Trade with the east became so important that when the Ottoman Empire, which stood between East and West, made it difficult and often impossible to use land routes, Europeans were strongly motivated to find alternatives to overland travel, sending navigators to explore the sea routes to Asia. Amitai-Preiss, Reuven. 1998. The Mamluk-Ilkhanid War. Cambridge, UK: Cambridge University Press. ISBN 9780521462266. Chambers, James. 1979. The Devil's Horsemen: The Mongol Invasion of Europe. New York: Atheneum. ISBN 9780689109423. Hildinger, Eric. 1997. Warriors of the Steppe: A Military History of Central Asia, 500 B.C.E. to A.D. 1700. New York: Sarpedon. ISBN 9781885119438. Morgan, David. 1986. The Mongols. New York: Blackwell. ISBN 9780631135562. Nicolle, David. 1998. The Mongol Warlords. London: Brockhampton Press. ISBN 9781860194078. Reagan, Geoffry. 1992. The Guinness Book of Decisive Battles. New York: Canopy Books. ISBN 9781558594319. Saunders, John Joseph. 1971. The History of the Mongol Conquests. New York: Barnes and Noble. ISBN 9780389044512. Sicker, Martin. 2000. The Islamic World in Ascendancy: From the Arab Conquests to the Siege of Vienna. Westport, CT: Praeger Publishers. ISBN 9780313001116. Soucek, Svatopluk. 2000. A History of Inner Asia. New York: Cambridge University Press. ISBN 9780521651691. This page was last modified on 13 June 2014, at 16:00.